I think the recent image by Guido Cavalcante, made in Ultra Fractal and used in a posting to illustrate the oceanic garbage dump phenomenon, is a good example of the contrast between art and craft, two concepts which I discussed in a recent post. In a nutshell, I defined art as expressive imagery and craft as ornamental, decorative imagery. These differing functions set art and craft apart from each other: art functions as a thought-provoker and craft functions as a table cloth. Sorry, I’m being harsh. Craft is visual beauty; pleasing to the eye and exhibiting the visual novelty of the medium that it’s made from –silent and elegant. Guido’s image is an excellent, text-book example because, with all due respect to Guido, it has no real value as craft. By this I mean that the image as a decoration is not very appealing. In fact, the image is actually rather ugly and revolting. No one would want this as their desktop wallpaper or printed on a coffee cup. Anyone sending this out as greeting cards to their friends and family would have to be an environmental activist intent on awakening their social circle to this oceanic waste disposal problem. Your Mom won’t be displaying a card like this in the living room if you send her one. Your Mom might, however, when discussing what her children are doing, or when discussing environmental issues, bring out the card to show you what her son has told her about garbage in the oceans and how he’s using his artistic skills to impress the issue in the minds of others. Notice the context that the image might be used in: it’s always associated with the topic of oceanic garbage and never as a pretty picture. Bocklin’s image has some nice natural scenery in it and illustrates (no pun intended) the huge amount of skill and craftsmanship that an artist needs before they can even begin to create art with such realistic subject matter. The painting medium is hard work and in addition to all that effort Bocklin has added his own dreamlike vision with surrealist elements (eg. note the size of the waves and yet she and the area around her is dry and strangely peaceful and remote). I’ll bet most people looking at this image have all sorts of thoughts moving through their head. Thoughts they wouldn’t have if Bocklin had merely painted a nice natural scene by the sea. That would have been nice too, but it wouldn’t have had the mental engagement that makes the actual painting a work of art rather than a work of craft. It’s the same with Guido’s The Garbage Path; what impresses us with that image is the haunting view of garbage out in the middle of nowhere which appears to be silently approaching. I’ll bet the impression most people get from looking at Guido’s image is exactly the same as that of the sailor that Guido quotes in his posting who unexpectantly discovered this garbage dump for real by sailing into it. What is the refuse of cities doing way out in the clear, clean ocean? This is worse than the imagery of cities buried in garbage from the Disney movie, Wall-e. What’s so sinister about the subject of Guido’s image is that garbage doesn’t belong there, our world is no longer what we think it is, and that the oceans have become a toilet that can’t be flushed. Guido’s image does all that. And that, dear readers, is the difference between fractal art and fractal craft. This got me thinking. Allow me to ramble a bit. Art and craft are not mutually exclusive. They simply look at different aspects of a certain image. Art, I think, has nothing to do with the specifics of the medium – a painting and a fractal can’t be viewed with different criteria regarding art. But craft has everything to do with the medium, its specific techniques and other properties, how they were used etc. An image can have a high art value AND a high craft value at the same time, or it can be weighed towards either one (or in the worst case, be useless in both aspects). If you only judge images by their artistic value as you seem to do, medium becomes completely irrelevant – we can’t talk about “fractal art”. It’s merely defined by its message and expression, independent of the medium used. The word fractal becomes relevant only when you start considering the image also as a work of craft. How much you value either criteria is up to you, of course, but I don’t think they’re two different categories, just two different criteria to judge art by. Again, I must completely agree with Esin. We have come to a point where it doesn’t make any sense to differentiate between art and fractal art. The image has to be valued as an image and not as fractal or whatever art. Is the creator of an image capable of conveying something, does the image have strength, does it touch? IMHO this will be very difficult without mastering the respective medium. 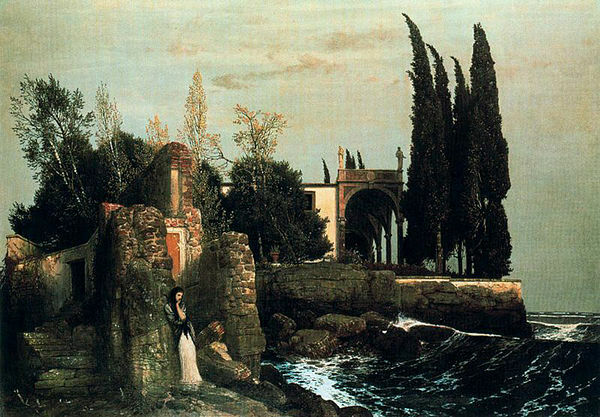 It is interesting that you used Böcklin to make your point, as soon as you leave the fractal world it seems to be natural to you to show an artist who also masters the medium, which is actually what I would call craftmanship and not wether you want to hang the image on the wall or not. Could Böcklin have had this strength without his immense skills? Without his capability to play with his tools? When it comes to using algorithmic art for creating scenes we get into a real dilemma. Why? For the simple reason that other media have much better possibilities to create expressive scenes. Algorithms are a little bit like painting with a piece of soap, I doubt that the spark will jump over to many outside the fractal universe. I do respect Guido’s passion and engagement, but hadn’t I been told what the image was all about I wouldn’t have seen it by itself. I had to read the whole horror to interpret something as garbage which I had seen as an unhappy color combination before. An instrument has to be practised, studied and played a lot before, MAYBE, it has this direct magic. If we say that everybody who expresses himself is an artist, everybody who makes a painting, a photo of the atrocities of the world, the words ‘art’ and ‘artist’ loose all substance, they become arbitrary. The same is, of course, true for what has been happening in the fractal world: The words art and artist were generously spread all over the place for every pretty or not even pretty image and thus became meaningless. I was doing a documentary, which made me away from fractals by some time. So it was surprising and very pleasant to read the text from Tim with references to my work. And I can see that the discussion has moved further and Nada dismissed the Garbage Patch – a little than a bunch of unpleasant colors – wich can not survive independently of the immediate reference to that particular fact. Well, I can guarantee that the Garbage Patch is like that – you will not see anything when you’re inside. The continuous movement of the ocean just smashed all the material in microscopic pieces. This allows the debris to enter the food chain of birds and fishes. 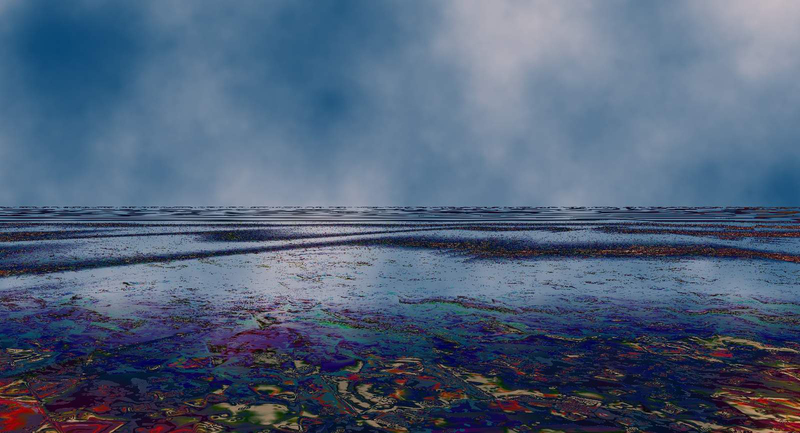 The image of the Garbage Patch is within a project you can see in fractalocean. Only patches of oil and dirty water. You need not understand anything but it is as if we were to invent a new way for the world we’re living in – a world where the references to the beauty and balance the senses are not worth anymore. I think this is what can make sense of art production today. And we should not say that to do certain images with fractal would be like to paint with soap – or rather, why not paint with soap? After all, we are here to overcome our limits, isn´t? And if something does not work all right, why should we not try it again. I think you should try to break your own prejudices and really try new ideas and forms. At least try to find new meanings to standardized and familiar images of fractals. Another thing is that Nada has horror to artists experimentings. Art for Nada is something established. Well you should understand that artists make different objects out of common objects, even though they are common objects, only that something quick displaced. If you see most of the works of contemporary art, alone do not mean anything – for example a can of soup – a trivial example – but aggregated in a chain of events has become so unique. Why not a can of soup from the supermarket? What an idea!!! Guido, I am sincerely sorry that you obviously feel offended by what I said. I had thought this might be a platform where we don’t spend our time wowing each other. I have chewed my part (one of my images was discussed here, it was called craft and not art and I agreed whole heartedly), whereas you are only willing to take the guys’ praise but unfortunately cannot stand any critique. It is absolutely amazing how you twist my words and give them a meaning that couldn’t be further away from what I wanted to say, and how perfectly you understand when you feel recognized and understood. My critique had absolutely nothing to do with a ‘horror of artists experimenting’. Actually up to now we haven’t come to a mutual conclusion yet what could be called art at all. We just shared opinions. My critique solely pointed to technical flaws. I would have loved to be able to say that your image was so good, so strong, that the horror of your documentary hit me without a verbal explanation. It didn’t, and I think the reason is -forgive me that I have to say it even clearer now- that I see very well that you don’t master the program, so your possibilities to express yourself visually within UF are very limited at the moment which doesn’t mean that you within yourself don’t feel the impact while you are creating. If I understand you right you intend to have an influence on people, but I doubt that you can achieve a strong impact on many others – I shiver when I think of the actual general art scene – without going deeper into the program. From your reaction I start to understand why for goodness sake there is this endless praising in online galleries even when critique is encouraged. It had always been a mistery to me. When nobody is willing to take some critique it is no wonder what mess our world is in. So let’s go to pieces together and sing this endless song: ‘Another masterpiece *FFF*! Nada, you do a series of statements of a totally personal nature by saying that I obviously feel offended by what you said – which is not true, simply because your sentences made me smile. Another of your statements is that I am only willing to take the guys praise but unfortunately can not stand any critique. It is all the product of your angry imagination, wich I am not interested to discuss. What matters is that the image I created is the first image to disengage fractal of known patterns sufficiently explored in recent decades. No more coils! No more swirls! Of course, my image becomes challenging because it touches the fractal stabishement that is practiced by craftsmen without the slightest aesthetic quality such like your monotonous work looks. Of course I did not intend to put my work as a form of challenge. Indeed I do not care of fractal aesthetic. Fractal for me is just a medium such as any that any artist can use. Some contemporary artists are drawing with sugar, with caviar and chocolate, with sand. Let’s put soap in this possibility. And mixed it with fractal formulae. However you said that my image wasn´t satisfying some technical standards – see, you are intending to determine yours as the only acceptable standards. This is a total nonsense. Artists do not have to be restricted to formula techniques. I remember a sentence from Godard, the author of La Chinoise, just to name one of the movies that made him one of the great artists of the twentieth century. He once said that if a filmmaker is willing to follow all the determinations labeled on Kodak´s film cans, could not shoot anything! The nouvelle vague, as you know, was fully realized on a transgression of the technical standards for a new photography and printing of light. Not to mention a new form of dialogue and editing – there is another phrase where is said that every film should have a beginning, the middle and the end, but not necessarily in that order. As you can see with these examples, the transgression is the first quality required for being a true artist. Do I need to keep giving more examples? Let us get back with The Pfeifer, XIX century Edouard Manet´s, considered by his transgression of taste as an ordinary image of a “playing card”. Your judgments link you to such reasonings. For the end you’re telling me that I do not know the program! Your levity is really childish and in direct proportion to your own inability to formulate an image that is really powerful and innovative because of your commitment to illustration and decoration. You continue with your pitiful statements saying that I intend to have an influence on people, but you doubt that I can achieve a strong impact on many others – it really seems more a statement of a poor and jealous soul. Sad woman. I can guarantee I do not want anything :-))) Take the path on your own and don´t worry about me. Surely we always be on different fields.